Quickly prototype and test your devices. Visually build remote monitoring apps in minutes. Simply drag and drop variables you want to monitor to create a monitoring dashboard. Coming soon: Use predefined UI components such as gauge, buttons, etc or implement your own. Whether your are on iOS, Android, Windows or Linux, there is a solution for you. Use APIs to create your custom application. We provide libraries to easily control your IoTize device. They handle the low level communication protocols such as NFC, Bluetooth Low Energy, Socket, LoRa and Wi-Fi. They also give you access to common functionalities such as variables monitoring, authentication and encrypted communication. API Guide General API guide. Walks you through how to connect to a device and take advantage of its features. Platform Guide Platform Specific Guide. API Reference Describes all the API operations with sample requests. IoTize APIs enable communication between your IoTize Taps (TapNLink or TapNPass) and your application (smartphone, browser or desktop). 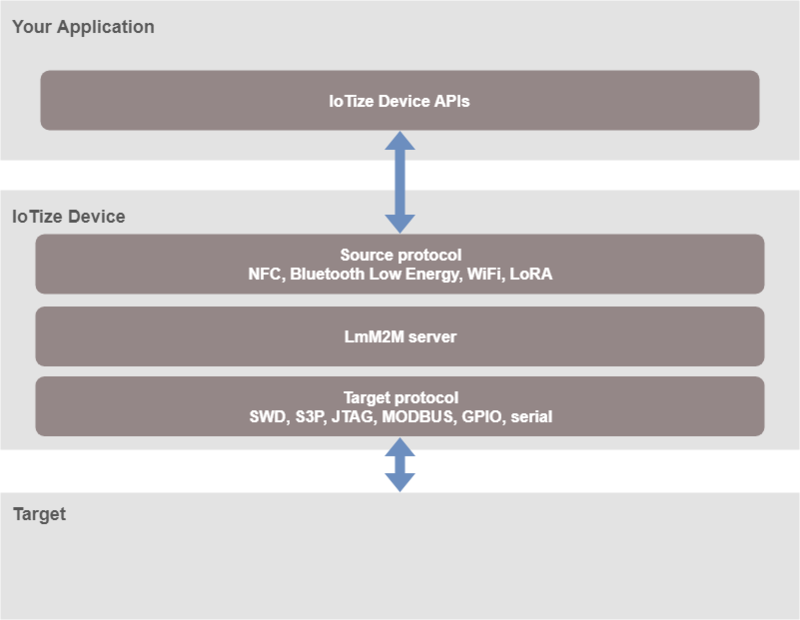 They provide various communication protocols such as NFC, Bluetooth Low Energy, Socket, LoRa and Wi-Fi. An IoTize Tap can been seen as a gateway between your non-radio-capable device and your smartphone application. It is a non-intrusive hardware and software component that provides bidirectional radio communication capabilities to any target application, and useful features such as variables monitoring, data logging and security. 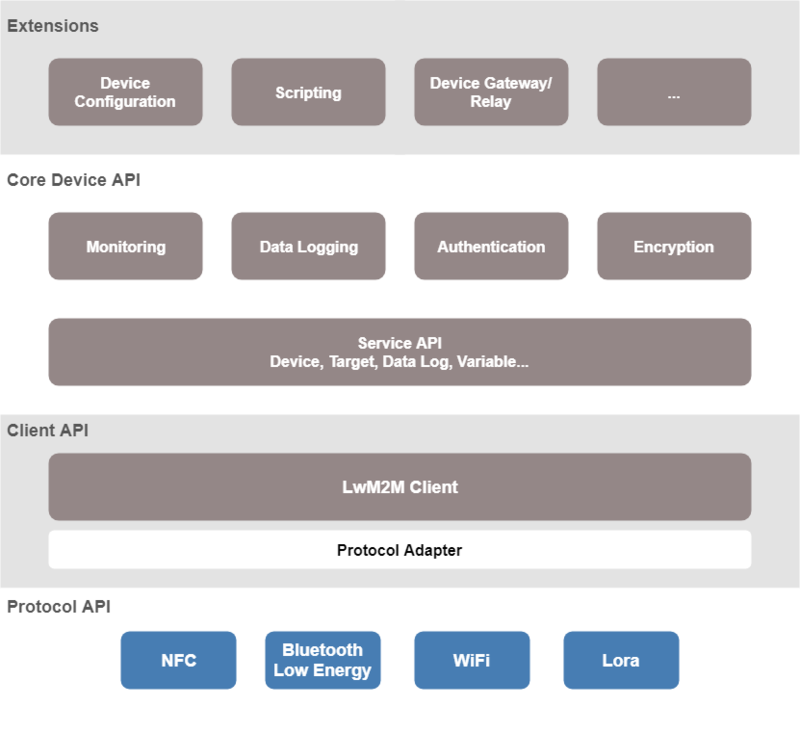 software applications (smartphone, browser or desktop) through NFC, BLE, Wi-Fi, socket or LoRa (the source protocols). target applications through SWD, S3P, JTAG, MODBUS, GPIO or serial protocols. Find more information about general architecture here. The IoTize API is separated into multiple layers. This layer controls receiving/transceiving raw data from/to the IoTize device. This layer builds and parses LwM2M commands and responses. Easy access to exposed Tap services with a user friendly API through named functions. Data encoding and decoding is managed for you. Relay library: Creates a relay (gateway) between two communication protocols. For example, you can create a relay that transforms incoming socket commands into Bluetooth Low Energy commands. Configuration library: Configures your IoTize device using configuration scripts.